It has been confirmed that Chinese fans are planning to take legal action against SM Entertainment and the Chinese sponsoring company for the cancellation of the Shenzhen ‘TVXQ Thrid Asia Tour-MIROTIC’ concert that was to be held on November 21st. A representative of Chinese TVXQ fansite Baidu BAR said in an e-mail interview that, “We were severely hurt by this event,” and “We could have understood if the concert had been canceled for reasons beyond anyone’s control, but we cannot sit idly by and let these deceptive tricks go,” and stated that they are receiving legal counsel for this case. KBS 2TV ‘Entertainment Tonight’ made a caption mistake. Broadcast on December 26th, ‘Entertainment Tonight’ featured Year-end special questionnaire to select stars of “Top News Maker in Year 2009″. The members of TVXQ who are currently in legal dispute with their label SM Entertainment were selected by votes as the Top 4 of 2009 News Maker. During the vote process, ‘Entertainment Tonight’ put a caption “Junsu, Changmin, and Yoochun are facing lawsuit against their label company” in introducing the case. As the problem is, TVXQ members who are actually in lawsuit against SM are Micky Yoochun, Xiah Junsu, and Hero Jaejoong. While Choikang Changmin and U-Know Yunho are the rest members who remain in position with SM. This caption mistake is not a problem that can easily be ignored. Moreover, the news wrote ‘Micky Yoochun’ (‘믹’키유천) as ‘Meiky Yoochun’ (‘미’키유천). TVXQ fans demanded a correction from ‘Entertainment Tonight’ regarding these mistakes. “If it’s me who get it wrong, it may be okay. But how can you have this kind of mistake?” “Names are sensitive issue in this case, and you get it wrong… it’s ridiculous.” “Just quick correct it and make an apology to TVXQ and their fans.” as the fans accused. 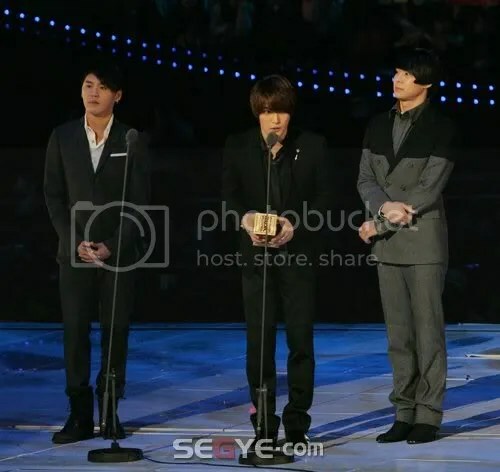 Another happening occurred as three members of TVXQ, YoungWoong Jaejoong, Micky Yoochun and Xiah Junsu, stated that their contract with SM Entertainment was unlawful. Many have begun to predict that the two sides will part with the forged signature controversy that erupted with the note of confirmation of the Shenzhen concert in China. However, the people taking the most active stance in this dispute between the three members and SM Entertainment, is the 800,000 member fanclub ‘Cassiopeia’. After this dispute began, they began boycotting SM while stating their reasons and what goods were to be boycotted. The reasons for boycotting span three pages of A4 sized paper and are as follows: the cancellation of ‘SM Town Live 09′, the unchanged attitude of SM Entertainment regardless of the numerous complaints by fans, and the unlawfulness of the TVXQ contract. After that, the fanclub held an offline and online petition that collected around 188,000 signatures from people who were against unlawful contracts, and submitted this to the Seoul District Courts under the name ‘People Against SM’s Unlawful Contract’. They also visited the Human Rights Commission and submitted a petition urging the commission to work hard to eradicate the contract of clauses that violated human rights. Some state that the three members of TVXQ were able to receive a partial acceptance of their request by the Courts because of the actions of the fans. These two events cemented the fans’ position as ‘consumers’ with authority. Also, they showed the entertainment agencies that idol group members were not mere ‘products’ to admire, but were ‘people’ who could be moved by the power of the fans. TVXQ fans submitted a civil appeal to the Ministry of Culture, Sports and Tourism stating that SM Entertainment began selling tickets for TVXQ’s Shenzhen concert before receiving permission from the Chinese government. To this, SM explained that, “We asked the concert planning agency in charge of TVXQ’s Asia Tour, and they said all legal permission and procedures pertaining to ticket sales for the Shenzhen concert had no problems whatsoever.” However, fans are stating that SM’s statement is a lie. Therefore, SM stated that ticket sales began on October 21st, when Dream Maker was given permission to do so. However, fans stated that, “‘Nanjing Asia Pacific Correspondence of Culture Exchange Corporation’ gave the authorization to sell tickets to ‘Piao’ on September 30th,” and “Ticket sales actually began before this date,” and presented evidence. The actual date of the transfer of the authorization of ticket sales did indeed begin on September 30th. To collect evidence that ticket sales began before permission was granted by the Chinese government, fans presented receipts and lists of order confirmation of fans who had bought tickets for the concert. According to this evidence, the payment bank account and money transfer receipt are both listed under the date October 11th. Other ticket confirmation lists are even dated as October 5th. This proves that ticket sales were occurring before permission from the Chinese government was given. 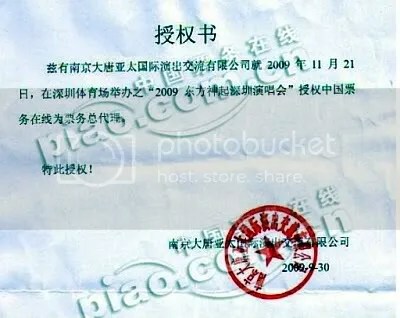 I, the writer of this note of confirmation, followed orders from ooo of SM Entertainment in March of 2009 and signed the documents for the Shenzhen concert instead of the three members. 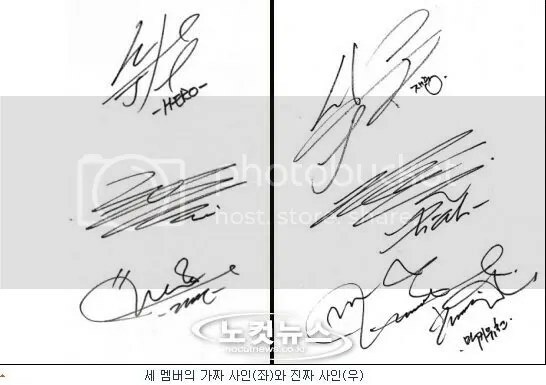 In signing these documents, neither the writer of this note nor SM Entertainment received permission beforehand and afterwards from the three members to use their signatures. The Shenzhen concert was completely unknown to the three members at the time of the lawsuit and it was confirmed after the lawsuit began. Three members of group ‘TVXQ’, Xiah Junsu, YoungWoong Jaejoong and Micky Yoochun, who are locked in a legal dispute with SM Entertainment, has stated that their signatures were forged on the note of confirmation for the Shenzhen concert and this is expected to cause major ripples in the case. The note of confirmation for Chinese performances is a document that proves that the musician will be attending the event through their signature. This document is placed where tickets are sold so that the consumers will know that the singer will be attending. They also released the real signatures of the three members along with the fake signatures on the note of confirmation. Before this, SM stated that the three members knew of the Shenzhen Concert before the exclusive contract suspension request was submitted and that they pulled out of the event suddenly two weeks before the concert which was why the event was canceled. SM also stated that the three members never asked to see the details of the Shenzhen concert contract. The 632 fans of TVXQ, Super Junior, SNSD, and SHINee are in process of filing application of collective disputes against SM Entertainment-Dream Maker for the cancellation of the planned August 16th SM TOWN LIVE ‘09, demanding compensation for property and mental damages. Korea Consumer Agency (KCA)’s Consumer Dispute Resolution Committee on last 23rd was asked by applicants related to the case of unilaterally cancellation of “SM TOWN LIVE ‘09″ as they demanded property and mental compensation which follows in collective dispute resolution procedure process on the 24th. Dispute Resolution Committee initiated this collective dispute resolution procedures, and the committee will receive registration from other victims of this issue to have the same batch remedies from November 25th until December 9th. 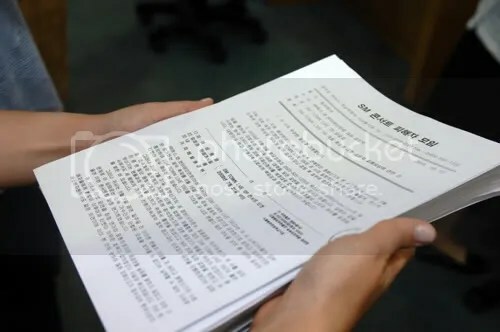 Consumers that are willing to apply can log in to Korea Consumer Agency website (www.kca.go.kr) – consultation area (상담 마당) – dispute resolution group (집단분쟁조정), ones need to apply in order to join the collective resolution remedies. Applicants must be ones who purchased Dream Maker Entercom’s “SM TOWN LIVE ‘09″ through domain auction and in case the applicant is a minor (a person who is under the age), the minor’s parents must apply for the participation as legal representative on the minor’s behalf. The presentation of this case is about the past contractor’s act of concert postponed or canceled unilaterally therefore asking for liability to refund for any damages had been occurred.